Yes I know it has been a while. I have been soooo busy. My job takes me out of town alot and there never seems to be enough hours in the day.....You know how it is. 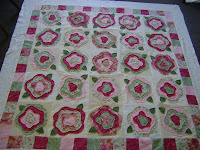 Anyhoo I have made some time to make a sample of this quilt. 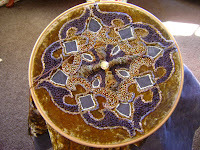 I am tutoring a class in Invercargill, for KITZ 'N' Thingz at the end of September at their weekend retreat. I have made it in flannel and it is raw edge, so once you give it a wash and dry, it will have a nice raggedy edge. 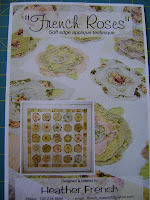 All I have to do now is get it in the post, so the girls can send it off to their quilting lady. This is not the piece I did at the weekend. We did something else, which I will show you another time. 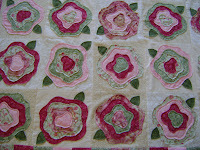 THIS is the piece I started at Jane's class in March!! All the ladies had finished their March project and they shamed me into finishing this before I get onto my next project. 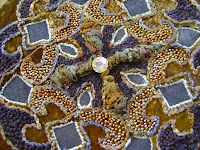 I only have a few more seed stitch sections to finish and then I am going to mount it onto a round canvas. With five weeks until fall market in Houston, I have just found out I will be attending as a buyer for the company I work for. Yes I can hear you all, OH YOU LUCKY GIRL! So loads of organising to be done. Hey Michelle, way to go, you have been doing some stunning work there, and I bet you are so looking forward to Houston- take me in your bags please?